Living the life of Riley: TPLO Recovery Day 6! Woohoo! I have officially hit a new record for monthly views on my blog! I'm excited to see that my #1 post is on the Vizsla heat cycle, now at over 1k views. 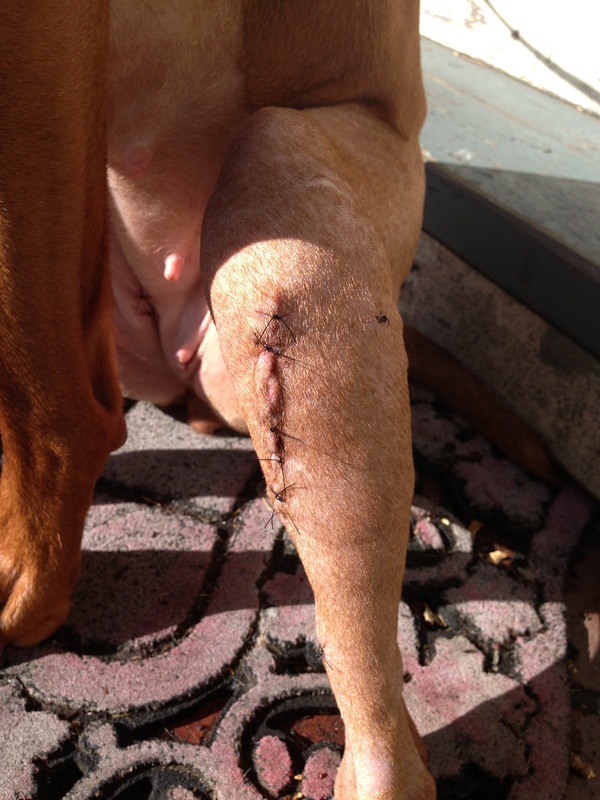 It's so important for people to know that they need to wait until their Vizsla girl is completely developed before spaying. I've had many emails from people who are curious about when they should get their girl spayed and my answer is always the same - wait until they are at least 12 months old and have completed 1 heat cycle. My plan was to wait 2 years for Riley, but I decided it would be better to have her spayed at the same time she was under anesthesia for her knee surgery. We got close - 2 heat cycles and 20 months! 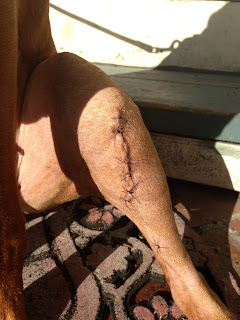 I'm really thankful that UC Davis placed the suture on the inner part of her knee. 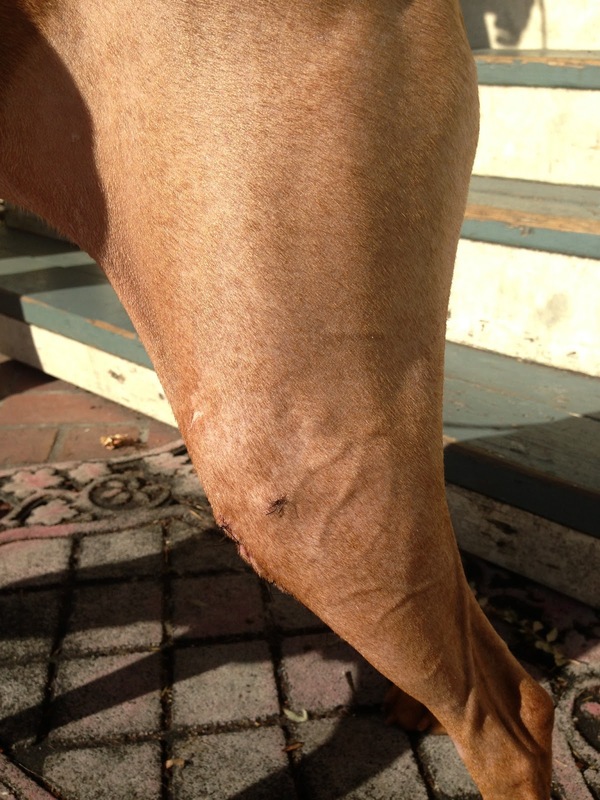 Riley has plenty of scars, so that doesn't bother me, but it does look nicer to have it partially hidden on the inside. I've been sleeping on a mattress on the floor with Riley at my parents' house because she's used to sleeping with us in bed at home. I think this past week I've had probably 24 hours of sleep total, but I don't mind. Maybe it's training for children someday? It's been interesting getting up between 2-4AM to give her pain meds. I'm lucky she's such a good patient and sits quietly while I give her the pain pills! I knew she was feeling better when yesterday morning at about 3AM my mom walked into the room carrying Riley who had taken off up two flights of stairs to go visit with her! Needless to say, she's sleeping in the crate at night from now on until she's healed. 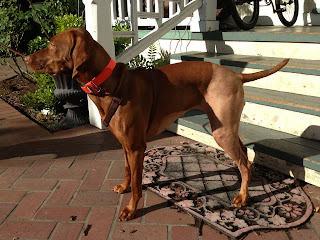 My husband took some more videos this morning of her walking that I will post as soon as they are up on YouTube. I am hopeful that someone can see these blog posts/videos and feel encouraged about recovery from TPLO surgery for their own dog.